The "Pickup Truck" is as American as baseball and the cheese burger. It is as American as our flag itself. KC's personal example shows what truly came of the American Pickup once it reached its prime. 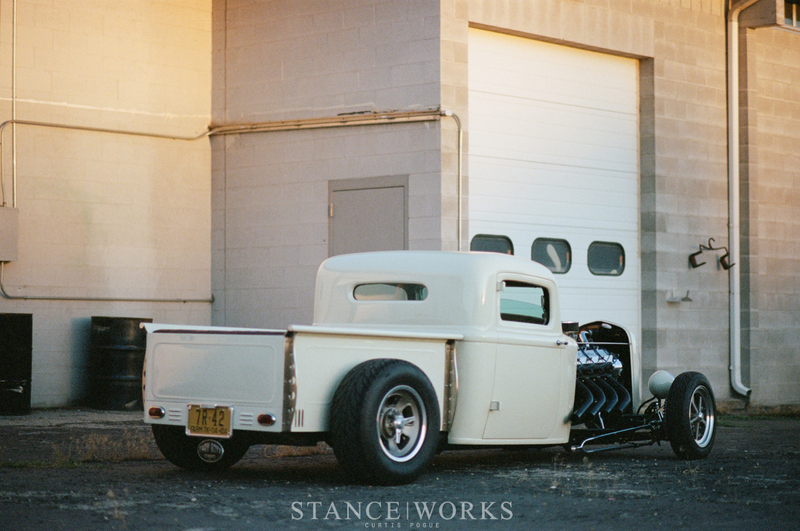 From the subtleties to the obvious, his 1934 Dodge 1-Ton Pickup is definitively true to its origins. 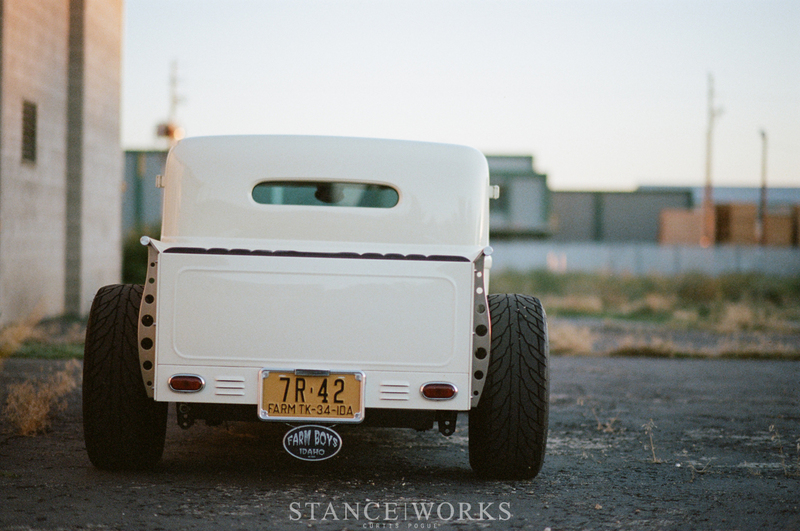 The pickup truck was born in 1925 with the introduction of Henry Ford's "Model T Runabout with a Pickup Body." However, the Model T was hardly more than a bucket for a passenger compartment, with a bucket mounted behind it for cargo. It wasn't until several years later that the definitive American Pickup took form. 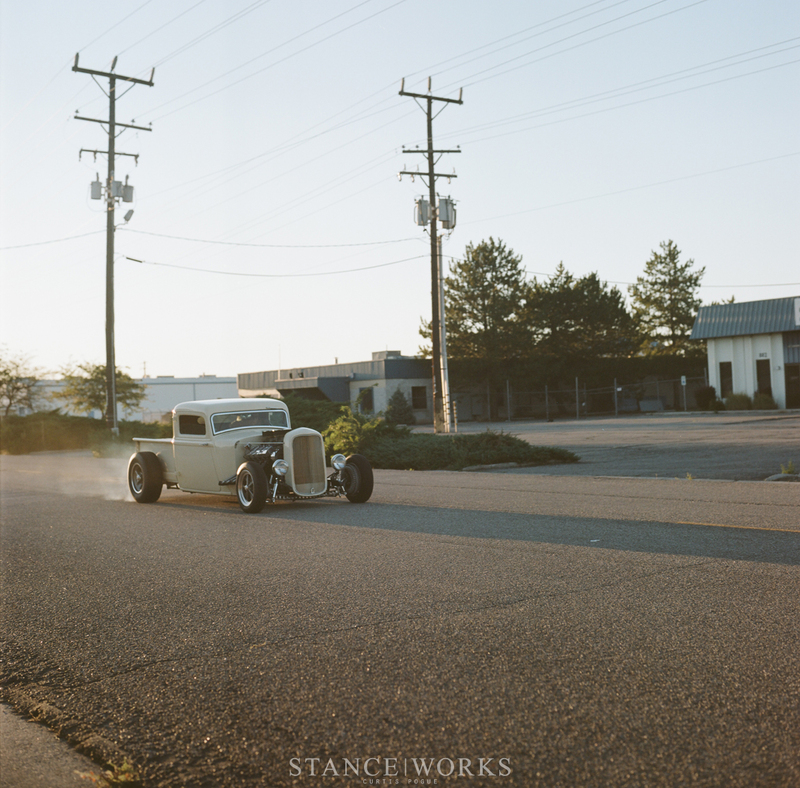 In 1928, the Ford Model A pickup was introduced - with defined lines, sharp edges, and a closed top, trailed by a bed to match, things were starting to resemble an archaic form of what we know today. 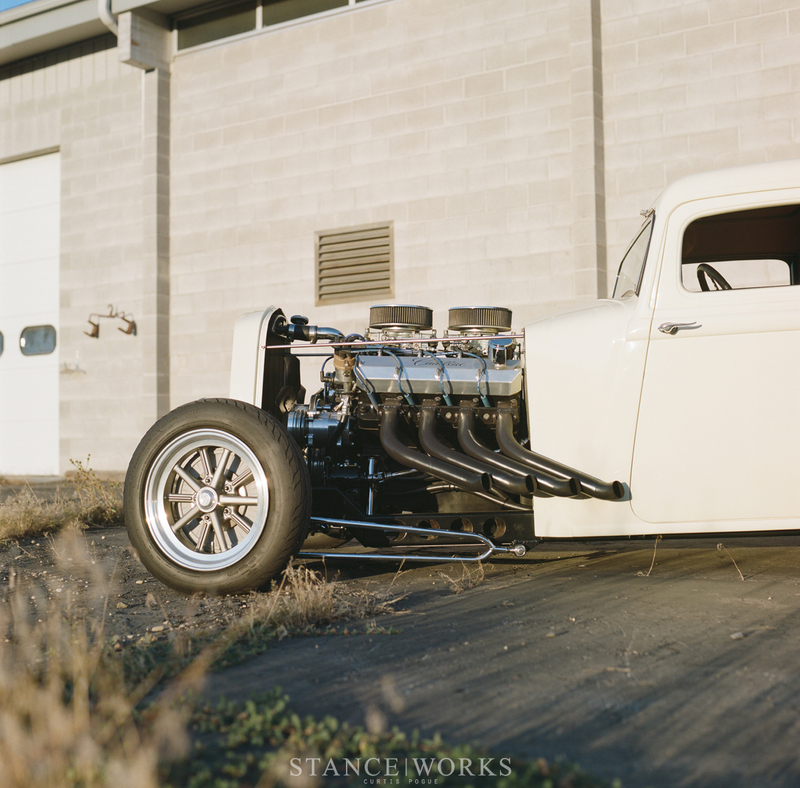 By 1930, the Model A had grown some curves and a bit more of an over-arching theme. Bodylines were improved, as was the trim, which created one of the most iconic vintage pickups in history. However, that's enough about Ford. In 1900, Horace and John Dodge founded the Dodge Brothers Company, which was born as an engine and chassis parts manufacturer and supplier. By 1914, one of Dodge's biggest clients was - you guessed it - the Ford Motor Company, with parts being supplied for its well-established Model T. The following year, in 1915, the Dodge Brothers took a major step forward, producing their own four-cylinder vehicle, titled the Dodge Model 30. The Model 30 was aimed at being marginally more higher-end than its competition, namely Ford's T.
The Dodge Brothers pioneered several aspects of automotive manufacturing that would later be adopted by the entire industry. The twelve-volt electrical system was the first of its kind, whereas other auto manufacturers kept with a six-volt system, often as late as the 1950s. The Model 30 was also built using an entirely steel body, whereas others, such as the Model T, and the later Model A, were built with internal wooden frames and supports. Through these efforts, and others, the brothers built a truly successful company. While history denotes Ford and his Model T as the pinnacle of automotive business at the time, the Dodge Brothers trailed behind in second place for sales figures as early as one year after the launch of the Model 30. The Dodge Brothers held their second-place position until 1920. While the reasons for their fall can be attributed to many things, two major events occurred that year that are hard to put aside. In January of 1920, John Dodge was killed by pneumonia. The brothers were close, and it's widely believed that Horace's death in December of 1920 - a result of cirrhosis - was caused due to the mourning, stress, and grief of the loss of his brother. After the death of the Dodge Brothers, the Dodge Brothers Company ranking fell, slumping down to a lowly 5th place in sales numbers for US auto manufacturers in 1925. The Model 30 had evolved into the Series 116, but it was no match for Ford's headway with the Model T and A. As a result, the Dodge Brothers' widows sold the company to Dillon, Read & Co, a well-known investment group, for the grand sum of $146,000,000 , which was, at the time, the largest single cash transaction in history. Just a few short years later, the New York investment firm turned around and sold the Dodge Brothers Company to Walter Chrysler, of the Chrysler Corp. With the $170,000,000 transaction completed in 1928, Chrysler had jumped into Detroits "Big Three." In 1930, the Dodge Brothers Company became known as "Dodge," and it was around the time that Dodge became known as the premier brand for light and medium duty trucks, which ranged from half to two-ton variants. 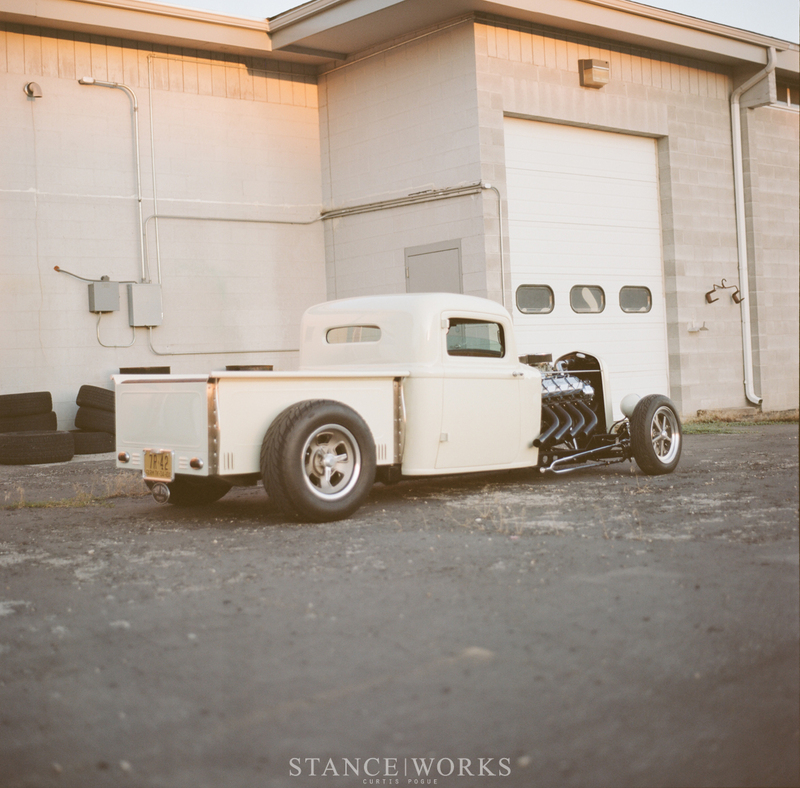 By the mid 1930s, Dodge had become the name of the American Pickup. That's when KC's truck rolled off the assembly line and onto the streets of America. 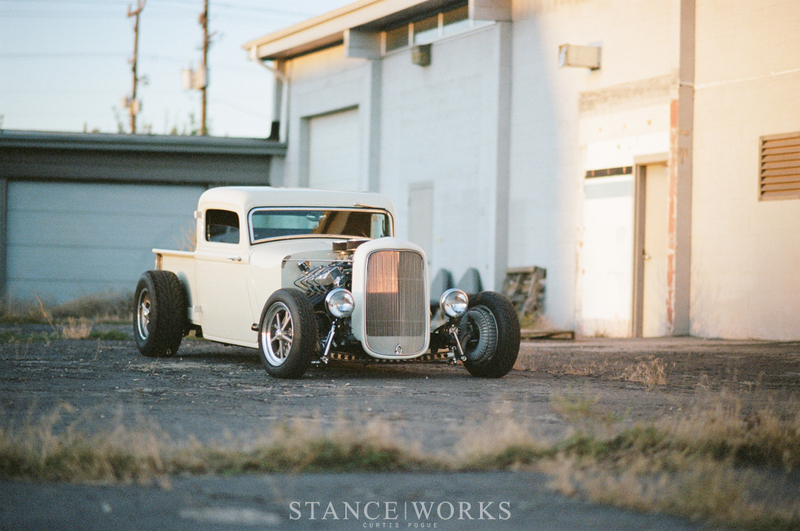 His 1934 One-Ton flatbed began life as any other, but he's done his part to make it entirely his own. 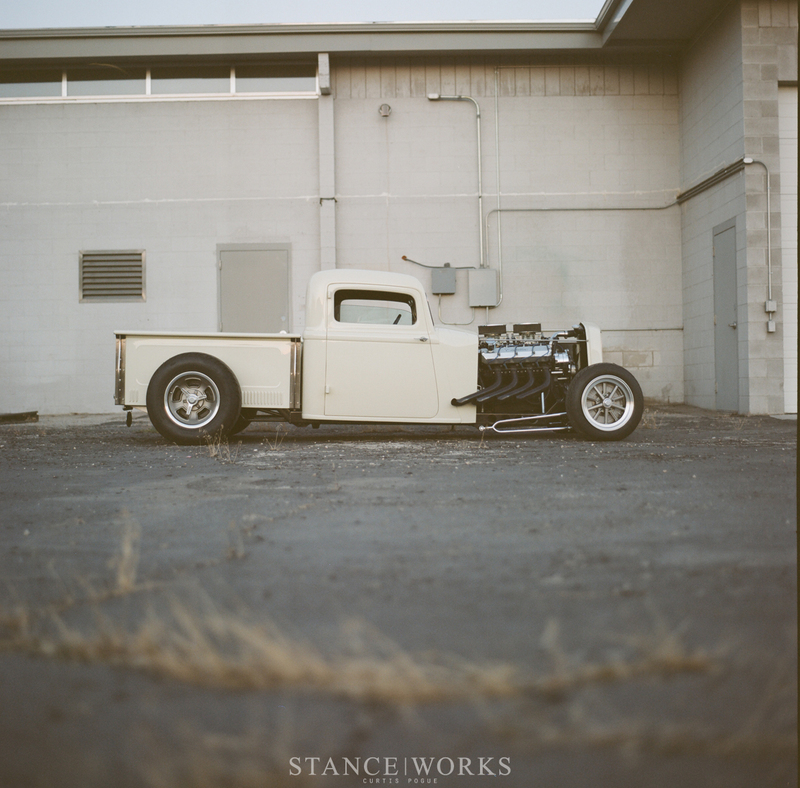 It's immediately obvious that his truck bears little in common with its original aesthetic. What was once a tall-cabbed flatbed now sits close to the earth, with a huge twist of traditional styling. The cab's shape remains, but with a healthy chop to the top, and a channel over the frame. 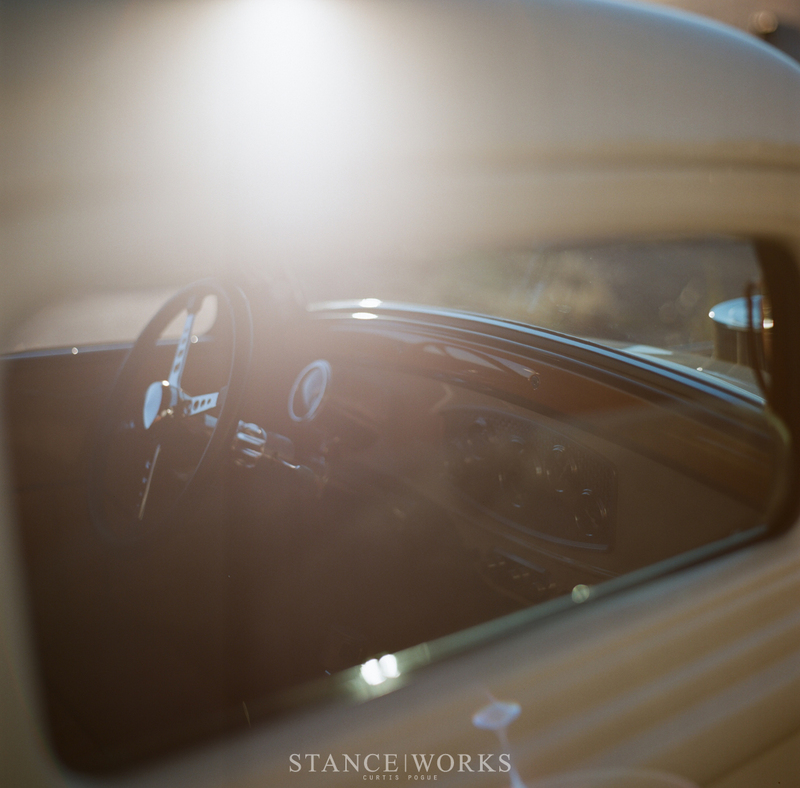 The gorgeous one-of-a-kind bodylines extend off the doors and roll into the cowl, where the hood and side paneling has been removed. 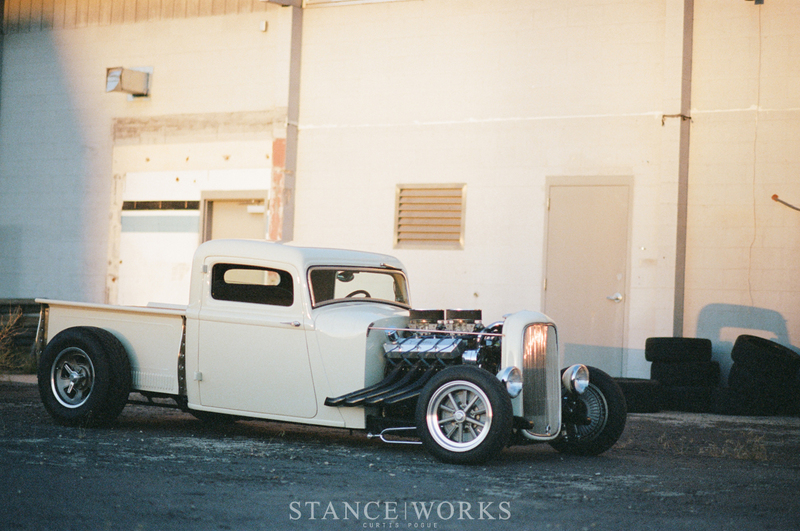 A beautiful, glossy layer of cream-white paint covers every panel, including the bed, which KC opted to replace the original flatbed with. 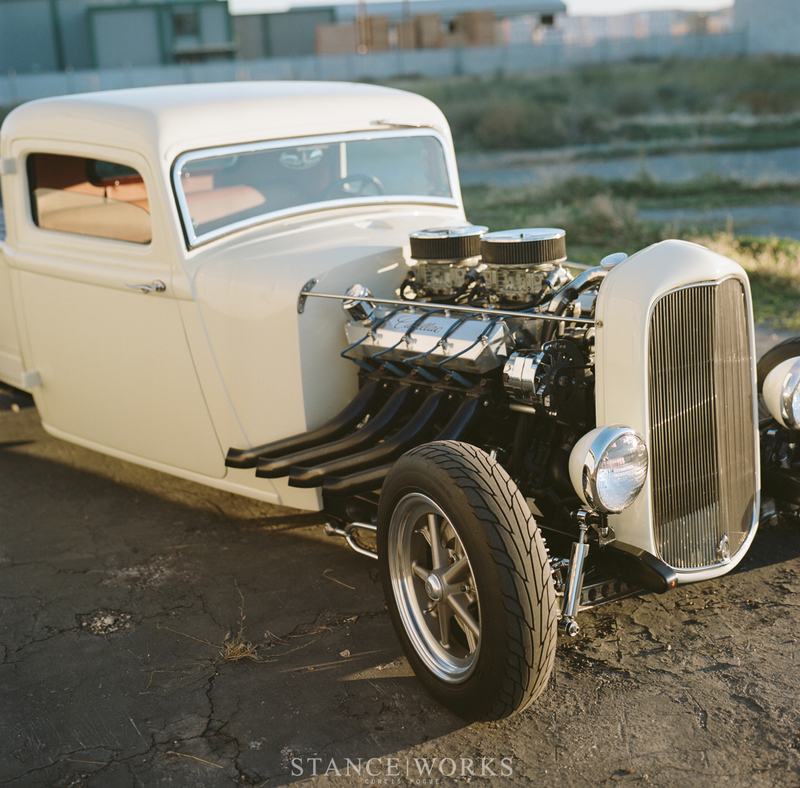 In the 1930s, Dodge was gaining prevalence with its famous straight-eight engine. However, KC went with something far bigger and better. Instead of single-file, the eight cylinders now find themselves in the iconic "V," thanks to the boys at General Motors. 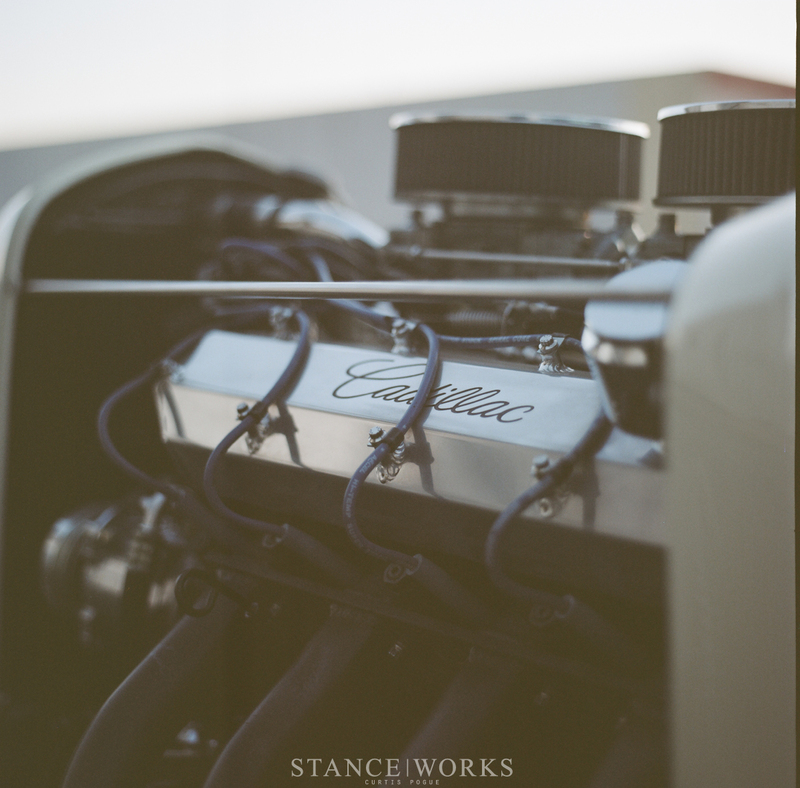 However, instead of the run-of-the-mill Chevy 350 small block, under the non-existent hood lies a massive 500 cubic inch Cadillac motor, built to pump out more than 600 horsepower and 600 lb-ft of torque. 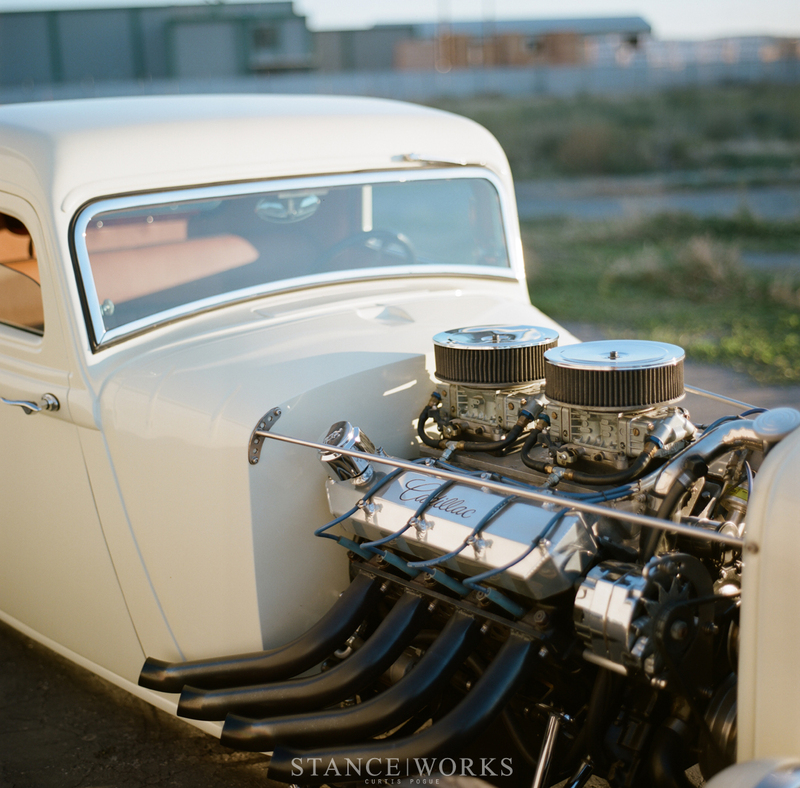 That means KC's '34 Dodge is one very fast '34 Dodge. The suspension and wheel & tire package are custom too, as is the interior, and nearly every facet of KC's personal build. If his truck didn't embrace the American Pickup, enough, KC forged forward in the all-American way, by tackling most of the build himself. While hands and shops helped along the way with projects like paint and interior work, the build of such a beautiful truck was carried out by KC himself. And that's as American as the "Pickup Truck."